Successfully summiting a mountain is a huge achievement, but all mountaineers will say the job is only half done at that point. You have to ascend safely as well. Harvesting a trophy animal is also only half the deed: you still have to get the trophy and cape back to your home base which in the case of Poronui clients is usually overseas. 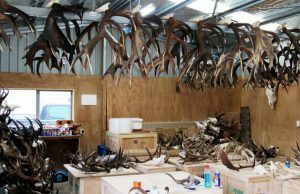 From a cost point of view the best solution is expediting (the exporting of un-finished animal trophies), and from the Lodge’s point of view the company to use is New Zealand Expediters owned by John Mitchell. He has been an expediter, based near Taupo for ten years, the last four as owner/operator, and over that period been involved in the processing and exporting of 1,200 plus shipments. The following information explains the process and was mainly sourced from the Company website www.nzexpediters.co.nz, while the photographs were taken by my camera on a recent visit. Readers should visit the website if seeking additional, information. Once a hunter has completed his or her hunt, an expediting form which has all the details that are required must be filled in. Poronui will have these forms and will provide clients with them to complete before they go home. When John receives hunter trophies, he will send an introductory email stating the trophies that were harvested and confirm all client details. Clients are asked to confirm the details are correct. The processing of harvested trophies then starts. This involves head skin prepping, fleshing and salting of skins and boiling and cleaning of antlers. 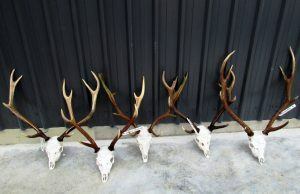 Skins will be sent dry-salted and can be tanned by client taxidermist or tannery when they are received. Appropriate paperwork is organised by John. He applies for a Certificate of Export permit from NZ Department of Conservation and arranges all of the shipping and freight documents. Once trophies are ready he makes up a plywood box to send them in. He will advise Poronui hunters when he has completed trophies and will send each an invoice, which he will charge to the credit card he was supplied with. Once he has received payment, the crate will be sent to Auckland International Airport and it will be booked on a flight through the shipping company GVI Logistics Ltd. The shipment will be sent to a Designated US Fish & Wildlife Port that is closest to the client Taxidermist / Tannery. Once it reaches that location, it will need to be cleared through Customs. It is highly recommended that hunters use a broker to do this. The whole process from when John receives trophies from Poronui until they are shipped to the nearest Designated US Fish & Wildlife Port can take up to 12 weeks.